On the 28th of October 1908 he successfully performed the first motor-flight. 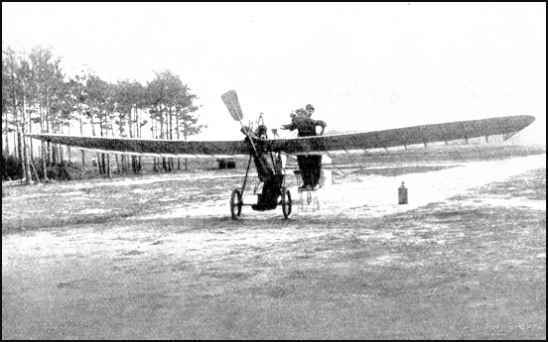 On October 30th 1909 he won the "Lanz-Preis der Lufte" prise and the sum of 40.000 Reichsmark, as the first German to fly an 8 loop around two posts standing at a distance of 1000 meters in an all-German aircraft. Bozena Langlerova, 1911 Bozèna Langler. seems to have earned her German Pilots License on October 19, 1911. She came from Czechoslovakia. The plane, in front of which she is standing in the photo above, appears to be a Hans Grade plane. Perhaps it is the one in which she learned to fly. I don't have any information further on her at this moment. via email from Dave Lam, 11-14-04 Bozena Langlerova was born in Prague on 11 December 1888. She is variously listed as Austrian or Czech-- the reason for this is that Prague was part of Austro-Hungary until 1918, when Czechoslovakia was formed as an independent nation. 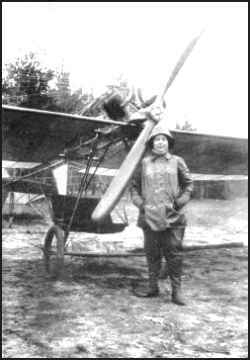 In Germany, she flew under the name of Lagler, and she was Hans Grade's first female student at Bork. She began her training there in Spring of 1911. In July, she crashed and destroyed the airplane, suffering some "internal bruising". She went home to Prague to recover, and after that she resumed flying. She became the first woman licensed by the Austrian Aero Club, earning license #37 on 10 October 1911. On 19 October 1911, she became the second woman licensed by the Germans, when she earned license # 125. She had another serious crash on either 22 or 24 October 1911 (my sources differ), near Kladnor (Prague area) , falling from 1500 meters, and again escaped , though this time she was transported to a Prague hospital "with llife-threatening injuries". She recovered and flew exhibition and competitions for the next couple of years, making appearances in numerous German cities, including Friedrichshafen, Leipzig, Hamburg, and Johannistal. ONLINE RESOURCES Using the Google search engine on "Hans Grade", (11-14-04),you will find about 397 links! Perhaps the two cited immediately below would be the best places to start. However, it time permits, you will be rewarded by following many of the other links. ein deutscher Flugzeugpionier This is a very valuable resource ,which offers a brief history of Grade in both German and English, and some 16 images which show several of his aeroplanes, his automobiles and some important documents including his "Airplane Driver's License" No. 2 issued in 1910. In addition, you will find a link to the Hans Grade Museum. I heartily recommend that you follow this link for you will find a beautiful picture of his plane in flight and if you find the little British Flag near the upper left corner of the page, and click on it, you will find two pages, in English, of great value. The first is offers a brief description of the career of Grade and of the Museum and its contents. If you click on the "the biography of the technical designer and pilot." phrase, you will find an extensive time-line description of his life and career. If you read German, or even if you don't, I suggest that you click on the little picture of an aeroplane, with the name Hans Grade, which you will find in the extreme upper left corner of the page. You will find an extensive story, in German, which probably offers much of interest regarding his life and career. For those of us who only read English,we can enjoy a very nice photograph of his plane. You can access this site by clicking on the title above. Short Biography of Hans Grade This link takes you directly to the same Time-line page which was described above. 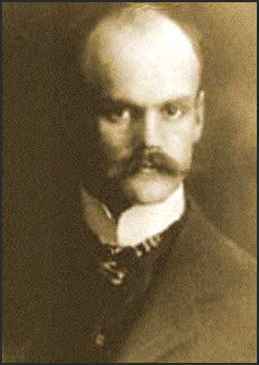 It covers the period from his birth in 1879 to his death in 1946. There are some 28 dates and incidents cited. The images don't show in this English version, but you can see them in the German version by clicking on: German Version. To access the site in English, click on the title above.